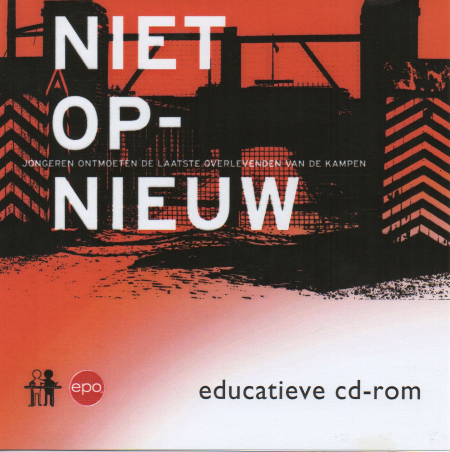 When the prize winning and then by far the best Flemish school project Niet Opnieuw (Never Again) of Menen college and School Without Racism – that interviewed the last Belgian survivors of the WWII camps – was to publish its book, a plan was made to rethink the classical remembrance education. Asked for advice and contributions we produced the CD-ROM Never Again in collaboration with School Without Racism and the teachers of Menen. Here we publish the general introduction. What could other pupils learn from the conversations between the pupils of Menen college and the last survivors of the camps? Let it for once be more than learning about the horror of the camps, the consequences of an undemocratic society, the resistance and imprisonment of the victims, their fate thereafter. Many books and projects have been made to that purpose. Today experts warn for possible reverse effects. So let it for once also be learning from. Of course still learning about too, let there be no misunderstanding. Because of respect for the life story of the survivors, the memory of those fallen, the value of the lesson in concrete history – in this case of a terrible period. And because of the modesty about the present that follows from this. But also learning from, learning beyond the facts of history. To that end we cannot limit ourselves to try and identify with the victims. We have to teach pupils that they, and we, can be potential killers too. Learning from ‘Auschwitz’ therefore demands integration of insight into the causes en circumstances that led to what happened then. So that today we could see where and when it threatens to happen again. So that today we shall not look away form the horrors around us. That is why this cd-rom starts with a short historical comparison between fascism and present day extreme-right. Since extreme-right ideas today often can enter the classroom we look at the question what a teacher can and should do about this. We set racism apart because of its importance in the comparison. We first look at several forms of racism before offering some advice to combat racism in school. We conclude this background information reflecting upon the relationship between education and politics: wherein lies the difference? The lesson plans mention the main end-terms. Citizenship education is the most general (transversal) end-term and the perspective that holds all the parts together. But end-terms are but formal and abstract goals. Learning from ‘Auschwitz’ reconnects them to the concrete open environment in which we teach and live.